DCUC Wave 12 Hi-Res Photos! Mattel sends along some hi-res images of the upcoming wave of DC Universe Classics figures! Click through for details and photos! 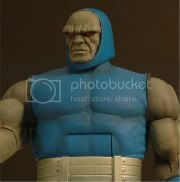 Below are images of DC Unvierse Classics wave 12, courtesy of Mattel. These are images of the original sculpts. Actual product may vary. Wave 12 is expected to ship in Spring of 2010. Discuss Wave 12 in our forums!